With the Higher Education Legislation and Financing Working Group having delivered its advice to the government on extending public subsidies to student places at non-university higher education providers, the speculation is that it will be proposing a considerably lower rate for these providers and for sub-degree programs. The Australian Council of Private Education and Training (ACPET) isn’t particularly happy. 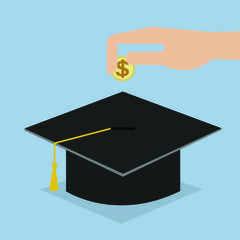 A review of budget documents by The Australian indicates that if the higher education reforms announced in the Budget are implemented, undergraduates can expect to attract an average of about $4950 a year in commonwealth support. But this drops to $2990 for diploma, advanced diploma and associate degree students. The figures suggest the government means to protect itself from a budget blowout as diploma students, traditionally funded by the states, shift to commonwealth-funded pathway programs. The Labor government addressed similar concerns by excluding diplomas from its demand-driven funding system. Separately, analyst Gavin Moodie says that students in the field of “society and culture” will have a subsidy of $6,021 in universities, but estimates that, on the information available, a subsidy of $4,275 in the same field at a non-university provider would be a reasonable estimate. The rationale for such differentials would be that non-university providers don’t have to bear the costs of research and that sub-degree programs would take place in non-university settings (including university foundation colleges). Part of the reason for doing an associate degree is that classes will be smaller and pedagogy more supportive. It doesn’t cost less to teach like this. It costs more. Moodie said the move would motivate universities to discourage students suited to sub-degrees from enrolling. But policy consultant Brendan Sheehan questioned how much Commonwealth funding rates would matter once higher education fees had been deregulated. He said there is no certainty that the government would make the change anyway, given the “rolling contretemps” such as the Senate defeat of the Coalition’s university savings measure. Meanwhile, ACPET has accused the fee working group of bias and self-interest , dominated as it is by universities. There are seven university representatives on the group including six vice-chancellors, with just two from TAFE and one from the private sector. Universities argue that at universities, commonwealth student subsidies goes towards funding research and pursuing the “public good” and therefore non-universities should receive significantly less. The universities had proposed non-universities receive 60% of the commonwealth supported place subsidy, while ACPET is arguing for a rate of 80-90%. George Brown, ACPET’s representative on the group, has called for the government to bring in an independent chair to replace La Trobe vice-chancellor John Dewar in the role. We feel severely outnumbered and we’re not sure our voice is being heard appropriately. I don’t know why the university sector, which has a vested interest in keeping non-university higher education provider funding down as much as possible, should have a casting view here.